"There was a lot going on in Greenwich Village, the clubs where Bob Dylan was starting out," recalls Mort Gerberg of this illustration for folk music magazine Hootenanny, one of the first in his career. "Everybody wanted to become a guitar player and a folk singer." Known for his clever combining of wit and social commentary, Mort has been a working cartoonist for more than half a century, most notably for The New Yorker. "Guitar Practice" is one in a series of limited edition prints we're offering (just 10 of each), numbered and signed by him with the same pen he uses to draw. 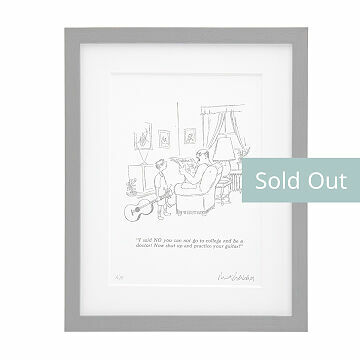 Framed in solid ash wood with a double-thick mat, it's a gift for the person who enjoys art with a wink. Printed and framed in Oregon.